Forget the Golden Globes or the Oscars, THIS is the awards show for us! 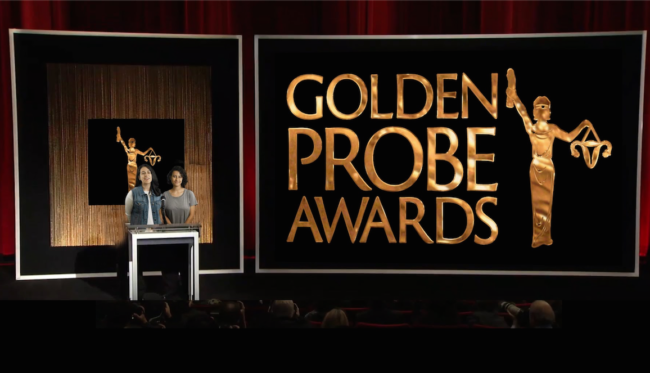 This Sunday, October 2nd, Lady Parts Justice will be hosting their first annual Golden Probe Awards, which will be honoring the outstanding achievement in the fields of sexism and anti-choice extremism. 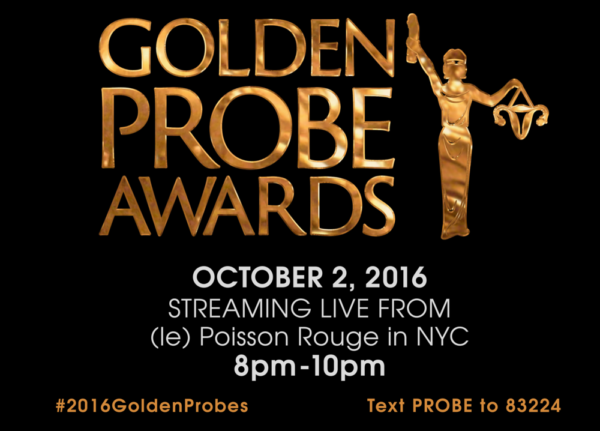 The Golden Probes will be streaming live from (le) Poisson Rouge in NYC, with watch parties all over the country. Hosted by hip hop artist, Jean Grae, the Golden Probes will also include a star-studded lineup of appearances from Sarah Silverman, Samantha Bee, Jessica Williams, Sasheer Zamata, Matt McGorry, Wendy Davis, Lea Delaria, the stars and creators of ‘Broad City’ Abbi Jacobson and Ilana Glaser, Amy Hagstrom Miller, Phoebe Robinson, Kate Walsh, Amy Brenneman, Kathy Najimy, Murry Hill, Buzz Off, Lucile, Ambrosia Parsley, Michelle Buteau, Franchesca Ramsey, Christian Finnegan, Naomi Ekperigin, Reformed Whores, Leah Bonnema, Holly Miranda, Matteo Lane, Lizz Winstead, and Eunice herself. 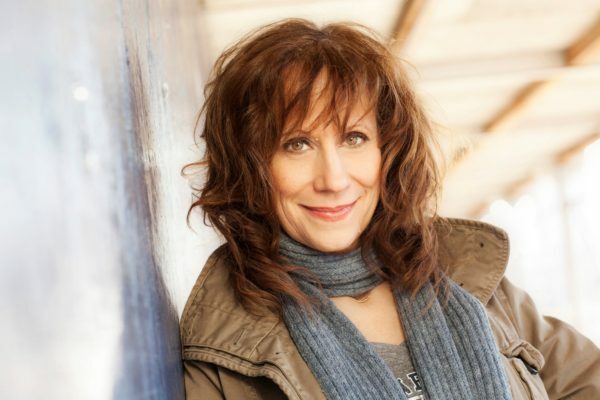 A few years ago, co-creator and former head writer of The Daily Show, Lizz Winstead, along with Arun Chaudhary, and Scott Goodstein, started the nonprofit Lady Parts Justice, a nonprofit focusing on sounding alarm about the terrifying erosion of reproductive access, and mobilizing them to reclaim their reproductive rights. If you are as passionate about reproductive rights and women being able to make their own healthcare decisions away from politicians and religion, then this is the awards show you cannot afford to miss. Given the two people on the Republican presidential ticket this term, LPJ may be more needed than ever. Donald Trump may be scary when it comes to reproductive rights, however, his running mate, Mike Pence is far more terrifying on this issue. While in Congress and as Governor, Pence waged war on a woman’s right to choose and restricting access to contraception – most notably with the “Pence Amendment”, which would essentially bar Planned Parenthood from receiving federal funding for any purpose. Not surprisingly, Pence’s obsession with regulating women’s rights over their own bodies has made him a conservative hero among fringe anti-contraception and anti-choice groups, such as the American Life League and others. But it does not end with the Trump-Pence ticket. As Lizz Winstead pointed out, the Golden Probe Awards are also important because they will highlight this extremism on a local level as well. “This election year, the presidential race is taking up all the media bandwidth, and the local races are basically forgotten. That is terrifying because when it comes to issues of reproductive rights and access, the state houses are where all these horrible laws originate. We at LPJ thought people needed to learn about the low level lowlifes who keep creating these laws and we wanted to do it in a way that was fun. So, since it’s award season, what better way to honor the best of the worst than a glamorous event that celebrates outstanding achievements in sexism and anti-abortion extremism,” she said. So what will you be doing this Sunday evening? We will most definitely be watching a satirical awards show “honoring” achievements in sexism & anti-choice extremism. Will you join us? Watch the livestream, Tweet about this, and host a viewing party with your friends. Want to know more about the work Lady Parts Justice is doing? Visit their website, and take a look at one of their latest videos which explains why overturning the Hyde Amendment is crucial to ensuring access to safe, legal abortion in the US is not just a right reserved for those with money.